Do you have multiple computer monitors on your desktop? I never would have thought it but I now believe that there is an upper size limitation with regard to the human interface factor when it comes to computer monitors when applied to every day desktop usage. Ever since Microsoft Windows 98, I’ve been using dual monitors and I hate going back to a desktop system with a single monitor. The miniscule single screens available on laptops I can tolerate, for the most part, so long as they offer a reasonably decent resolution, e.g. 1440×1050 or 1600×1200, but I don’t use laptops for the kind of work I do at my desk anyway, so it isn’t an issue. A lot of studies show that higher resolution monitors and multiple monitors increase productivity significantly. 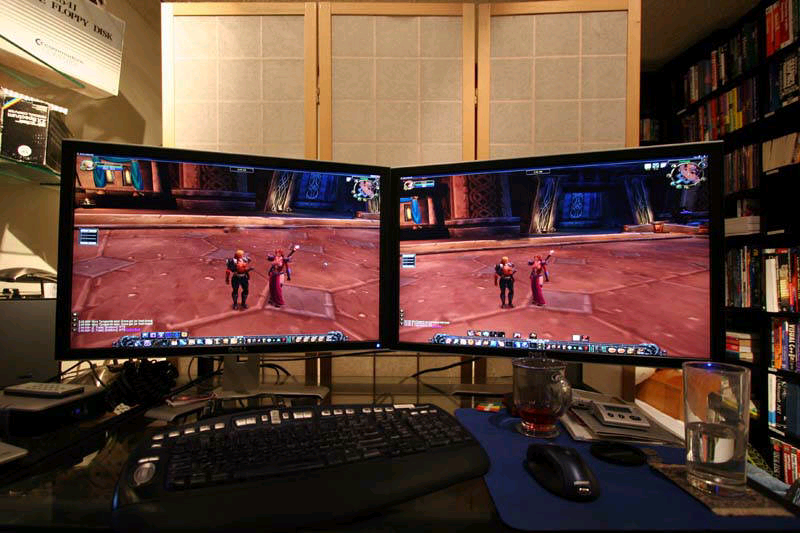 I’ve been using my dual Viewsonic VP201b 20.1″ LCD panels, both running at 1600×1200 resolution, almost exclusively in portrait mode — which is ideal for editing code and writing articles though not so good for playing games, I always thought Dwarfs and Gnomes in World of Warcraft were at least five feet tall as I ran around playing my Night Elf Hunter until I switched my monitor to landscape mode one evening and then I was all like “You’re so short!” — Since mid-2004. I decided in February that I would like to upgrade to a pair of Dell 24″ panels capable of handling 1920×1200. After a little thought and research I decided to move to a single Dell or Apple 30″ panel, capable of running at 2560×1600 resolution. Equivalent in resolution to my two Viewsonic monitors plus a little bit more. My ATI X850 graphics card maxed out at 2048×1600 so I would have to upgrade the graphics card. Which would also entail a whole new motherboard? All this extra stuff is besides the point I’m trying to make, which is that I did my research and decided on an EVGA (nVidia) 8800GTX Dual DVI graphics card, which is capable of driving two LCD monitors at resolutions up to 2560×1600. Because the graphics card is capable of driving two enormous LCD panels, why not purchase two of them? This is equivalent of having four of the Viewsonic VP201b 20.1″ LCD panels on my desk all configured in portrait mode. Great! Wow! They’re absolutely fantastic too look at. With just a few niggles. The first is that I have to actually turn my head to see the far right corner of the right-hand screen. I know, poor me. Sympathy, please. But the other problem is that because the monitors offer so much real-estate there is no delineation between one window and the next. I cannot just maximise my browser window most of the time because it then fills the entirety of a very large desktop and most applications just don’t make good use of that much space with their user interface. Though it is dashed handy for those shockingly bad web pages that have text that runs all the way across to the far right of the screen and requires monitor three feet wide to read. Imagine living in an utterly enormous loft/studio that is completely open plan. There’s no delineation between the bedroom, the kitchen, the living room, the bathroom, the home office. Some of you probably do, but for me, I need boundaries, I need places for things. No matter where you go, you are always, in some way, still part of that other room. You can’t just close the door and shut out the mental processing of that other space. And that’s exactly what it is like with a really large monitor. I can’t turn away from the other screen to concentrate on what’s in front of me. I can’t shut out the clutter and noise requiring mental bandwidth that is right in front of me in another window. I can understand if this sounds like someone who is looking a gift horse in the mouth but… a huge single monitor is not the ideal arrangement for working with a computer. I would honestly prefer to have four 21″ monitors side by side. I’d still have to turn my head to look at all of them, but when I maximize a window, it won’t take up my entire field of vision. They totally rock for dual boxing on World of Warcraft though when I’m healing on my dual priests in UBRS.